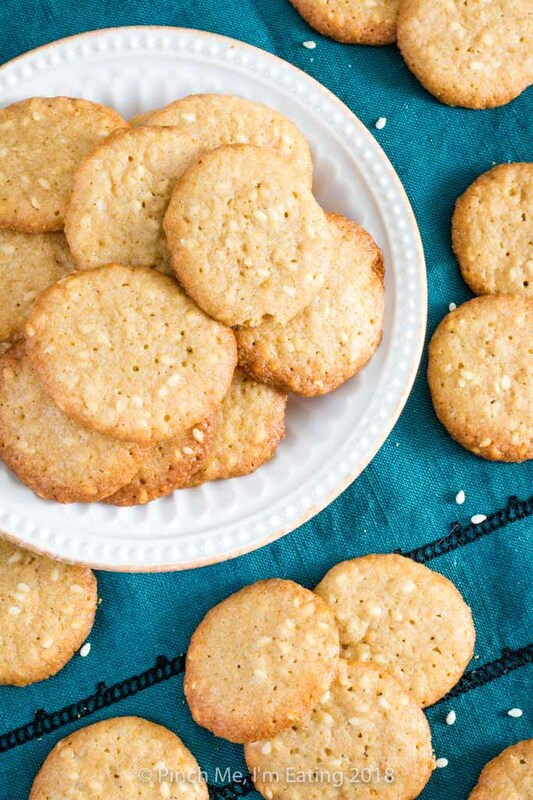 Benne Wafers - Charleston's Classic Sesame Seed Cookies | Pinch me, I'm eating! 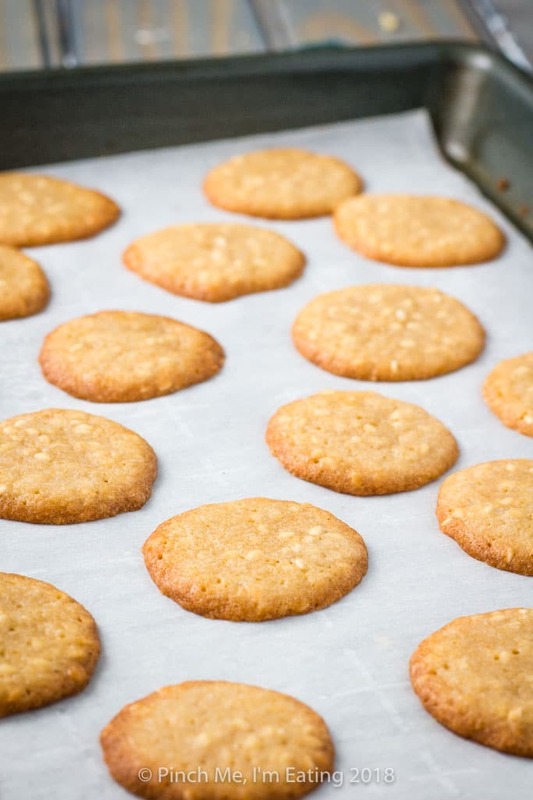 Benne wafers are traditional cookies from Charleston, SC made with benne (sesame) seeds. 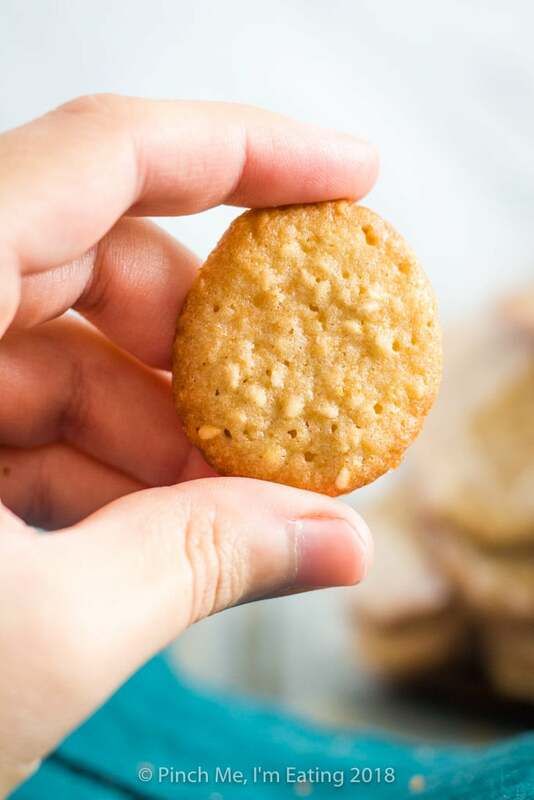 Bite-sized and crunchy, they make excellent tea cookies and are ideal for wedding or shower favors or Christmas gifts! 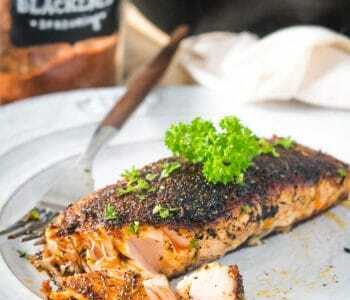 This easy, old fashioned Southern recipe will give you that unique, traditional South Carolina Lowcountry flavor you’re looking for! 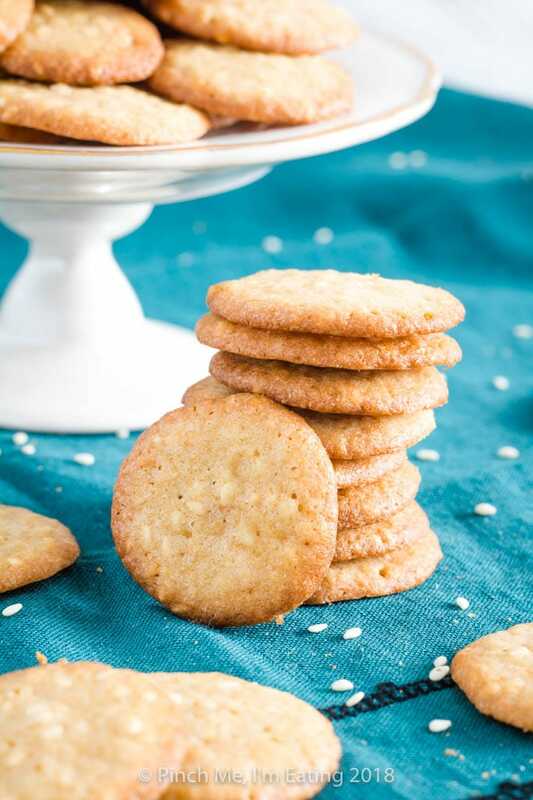 Growing up in Charleston, South Carolina, one of the local treats I’ve known my whole life are the tiny, crispy sesame seed cookies known as benne wafers. Sweetened sesame is a unique, slightly nutty flavor you may not have had before, or perhaps you associate it more with Asian cuisine – but it’s the flavor that makes this treasured Southern staple so distinctive. They’re definitely worth a try if you haven’t had them before! While I’ve always been able to pick up a bag of benne wafers when I’m downtown or even in the local foods section of our grocery stores, I have to say making them from scratch is so satisfying and even more delicious! 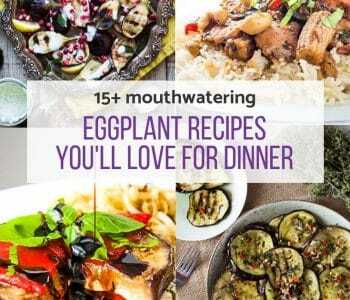 And unless you live in Charleston, making a homemade batch may be the easiest way for you to taste some of these classic Southern delicacies! And the recipe is quite easy. The only thing to watch out for is that it makes about a million cookies (over 150!) so you do have to continually feed cookie sheets into the oven for quite a while to use up all the dough. Since the recipe makes so many cookies, they’re perfect for bridal shower or baby shower favors or Christmas gifts. Just put them in a treat bag with a cute little label and you’re good to go! 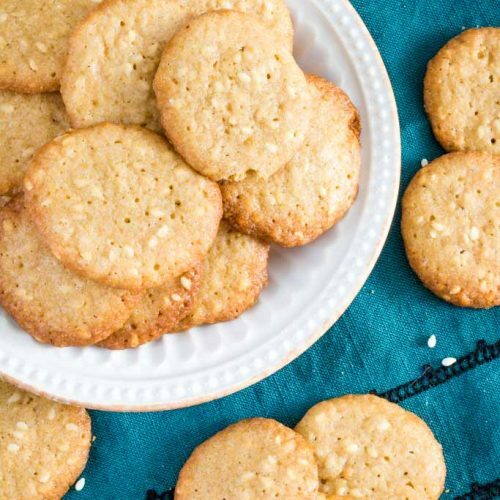 They also make excellent tea cookies since they have a unique and delicate flavor perfect for complementing a cup of tea without stealing the attention for themselves. 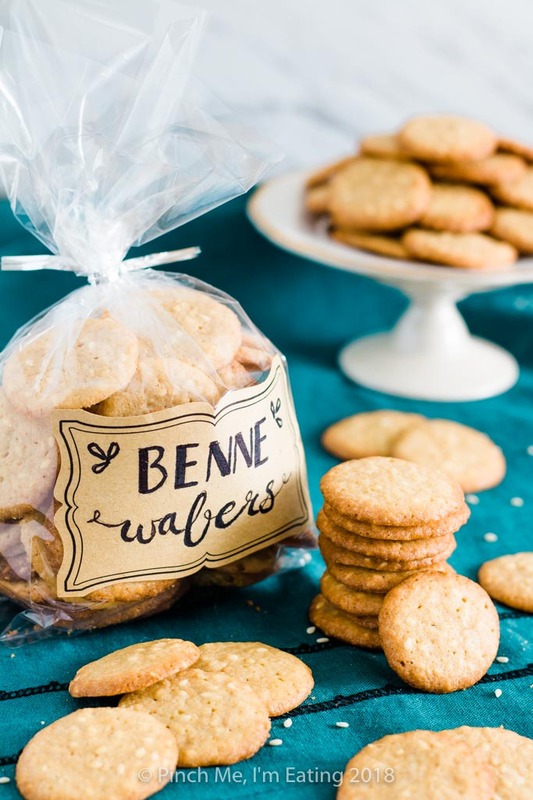 Benne wafers are delicate, crispy sesame seed cookies originating in the Lowcountry of South Carolina. You can find them today at the outdoor market downtown Charleston, as well as in local Charleston specialty shops and grocery stores. But the history of the benne wafer is much longer, originating in the colonial era. Benne, the plant that produces sesame seeds, was originally brought to the South Carolina Lowcountry from Africa through the slave trade in the 1700s, along with okra and other Southern staple foods. Because of their flavorful and nutty quality, they were used to flavor rice and other foods, and the seeds were also ground into flour. 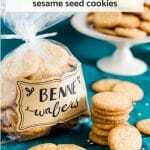 Benne seed wafers themselves (known more often simply as benne wafers) are delightful little bite-sized cookies highlighting the flavor of the sesame seeds, and have been around for well over a century. Benne seeds were also believed by the Bantu people in West Africa to be associated with good fortune, so these cookies are also a symbol of good luck! 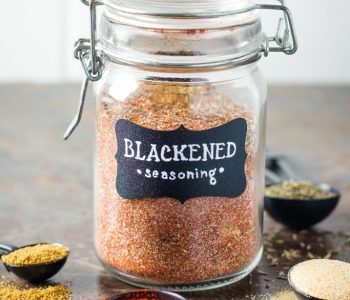 Since benne (pronounced “benny”) is simply the Bantu word for sesame, you may think benne and sesame are completely interchangeable terms for the same ingredient. 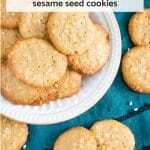 But there are differences between a traditional benne seed and a modern sesame seed. After benne was first introduced in the Southeast, it was soon cultivated as a cash crop since the oil could be used as a less expensive alternative to lard and imported olive oils. Over time, the benne plants were cultivated and crossbred to maximize their oil-producing qualities. 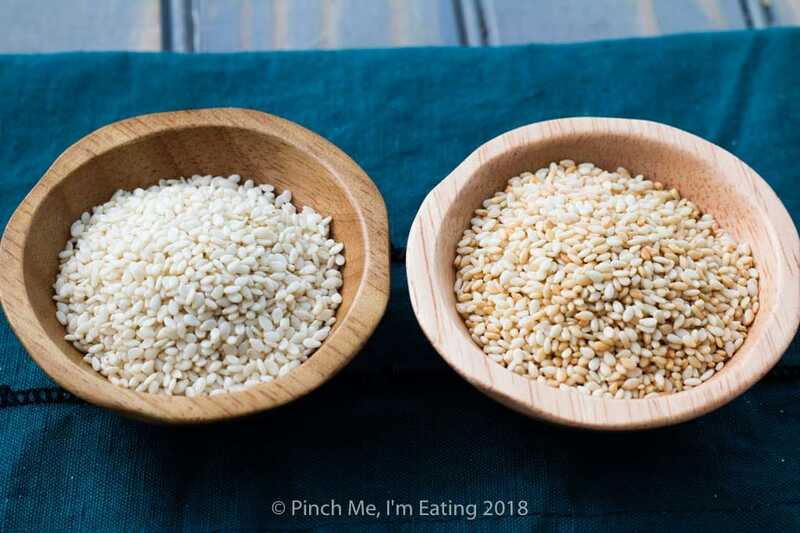 The result is the modern sesame seed, which is much less flavorful than the original benne seed, but has a higher oil content (60% in the sesame seed vs. 45% in the benne seed), according to Discover South Carolina. I recommend for this recipe toasting your sesame seeds to bring out a little more of that nuttiness so characteristic of benne seeds, or if you want the real deal, you can order heritage-grown benne seeds from Anson Mills. You can see the difference here in the toasted vs. untoasted sesame seeds. 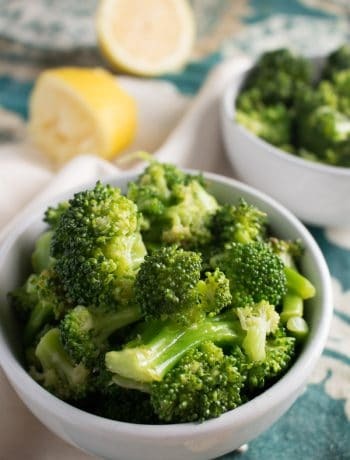 Browning them for a few minutes in a dry skillet makes a big difference in color and flavor! I have adapted this recipe from a cookbook given to me by a friend in elementary school – Treasured Recipes from the Charleston Cake Lady. It has all sorts of recipes for baked goods local to my beloved hometown! 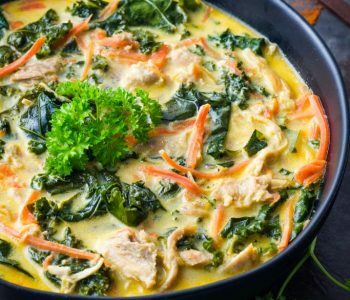 While the ingredients are pretty much the same, I have a couple modifications to the technique. First, the book says to use a greased cookie sheet, but I found it to work much better on parchment paper. With a greased sheet, the cookies spread with much more fragile, lacy, and overly browned edges. On parchment paper, the benne wafers spread just enough and had smooth edges. You can see the huge difference here! 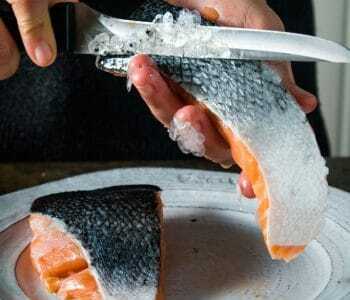 The other advantage to using parchment paper is that they are easy to remove even when cool. On a greased sheet, the cookies stuck so much as they cooled that they shattered when I tried to get them off the cookie sheet and I had to put them back in the oven to soften! On parchment paper I could take my time removing them and they stayed perfectly intact. The other suggestion I have was a bit of a revelation on my last batch of cookies. In order to get the tiny bite-sized cookies here, each ball of dough is only half a teaspoon’s worth. Also painstaking, because this recipe makes batch… after batch… after batch. I realized on my last sheet of cookies that it would be much easier to simply pipe the dough into tiny lumps, rather than measuring out half a teaspoon each time. You could even get the cookies a little smaller this way if you wanted! 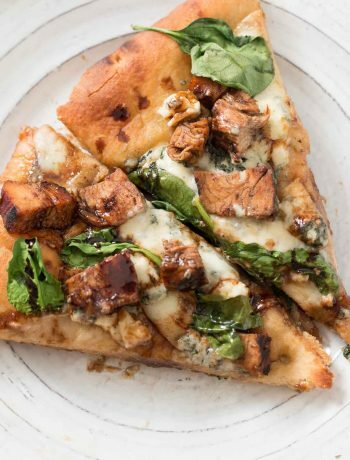 Just spoon the dough into a heavy ziplock bag and snip off the corner. 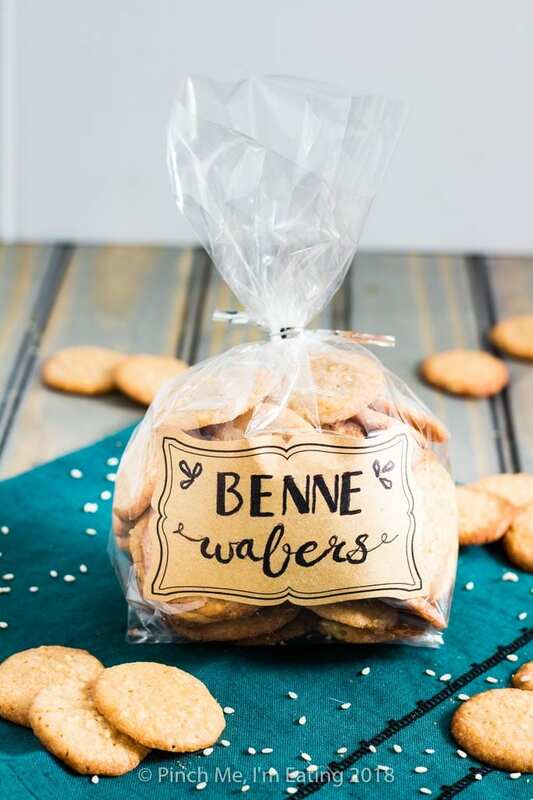 Benne wafers make great favors or gifts! If you’re looking for a great homemade bridal shower, baby shower, or wedding favor, these are an excellent option because the recipe makes so many cookies! 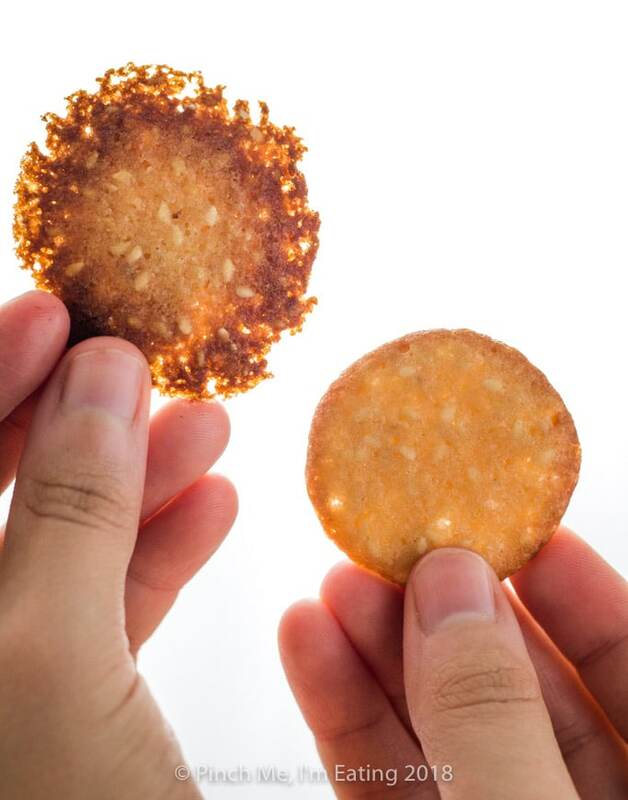 Remember, in order to get the tiny bite-sized cookies, each benne wafer only uses 1/2 tsp. of cookie dough. Half a teaspoon! Do you know how many cookies that made me in this recipe? At least 14 DOZEN. That’s over a gross of cookies (a gross is a dozen dozen, or 144). For this photo, I put four dozen benne wafers to fill out one of these little 4″ wide treat bags. Even with that many cookies, you can get three Christmas gifts out of it and still have some left over for yourself! Or you could use a smaller bag like these 2″ wide ones and give two dozen cookies to six or seven recipients! These are good for quite a while and we were still eating them a couple weeks after I made the recipe. They do get a little softer with time but the benne seed flavor actually gets stronger! Store them in an airtight container and they’ll be good for at least a week (or two, if you don’t mind them a little soft). 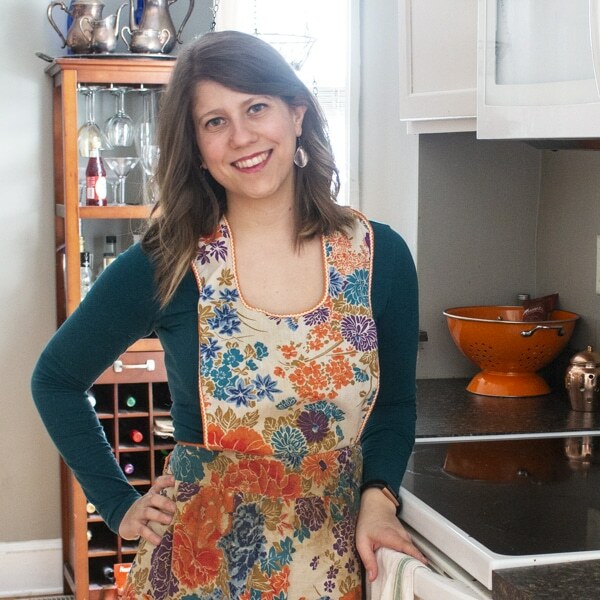 Please let me know if you have a chance to make these delicious local cookies! If using sesame seeds, rather than authentic benne seeds, toast seeds in dry skillet over medium heat, stirring occasionally, for 3-5 minutes or until lightly browned. Set aside. In a medium bowl, cream together butter and brown sugar until well mixed, light and fluffy, about 5 minutes. 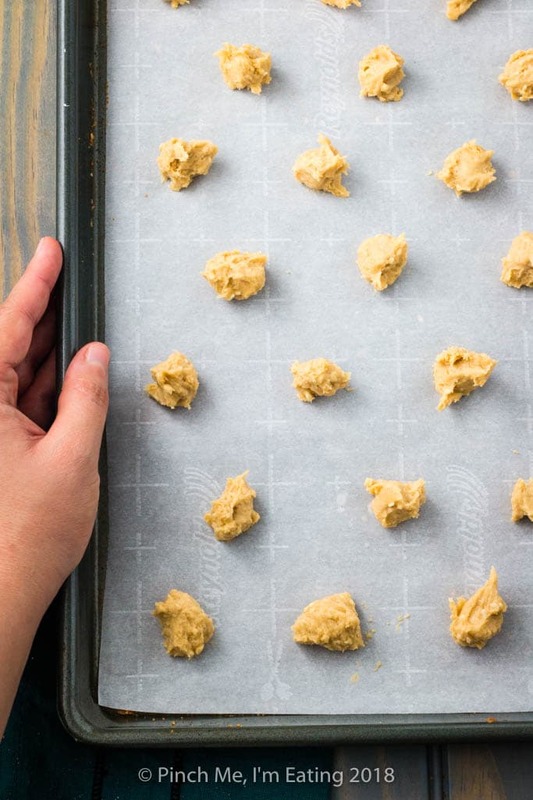 Make it extra fluffy to add volume to the dough so you get the full number of cookies out of it! Add the eggs one at a time, beating well to combine after each egg. Sift together flour and baking powder. Stir dry ingredients into butter-sugar mixture. Stir in benne or sesame seeds and vanilla extract. Drop dough by scant 1/2-teaspoons-full (I did a little less than 1/2 teaspoon to make them more bite-sized, since the dough spreads quite a bit) onto parchment paper about 1 inch apart. 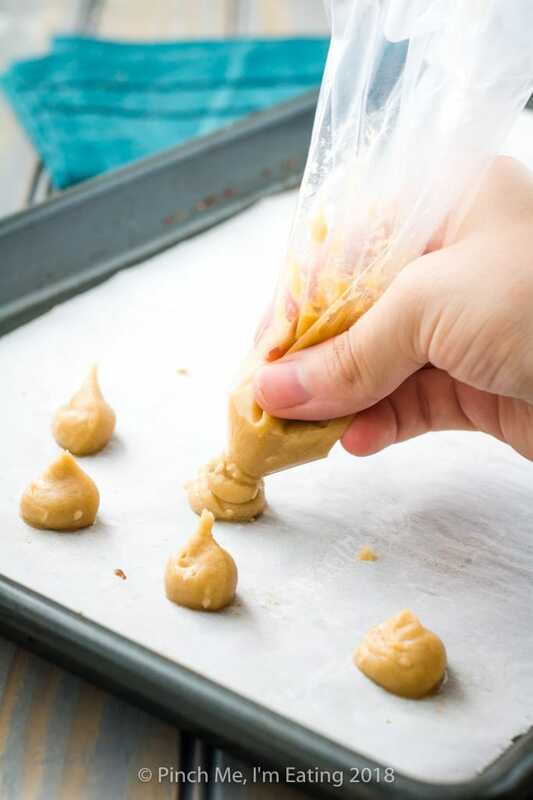 If desired, spoon dough into a ziplock bag and trim off the corner, or into a pastry bag, and pipe tiny amounts onto the parchment paper instead of using spoons. Bake for 7-9 minutes or until edges are lightly browned. Remove cookies onto a rack to cool. Store in an airtight container or separate into baggies as gifts or favors. The recipe I adapted from says it makes 4 dozen cookies at 1/2 teaspoon each. I got 14 dozen cookies at (scant) 1/2 teaspoon each. I'm sure the scant half teaspoon allows for some of the difference, but creaming the butter longer until it's extra fluffy may make the rest of the difference in quantity.